Recounting our journey so far can be likened to the wilderness pilgrimage of the Israelites. We have always been a people, a nation from a region, chosen by God and a specially made generation of undying gene with the capability and capacity of surviving in all kinds of situations. We are survivors with anointing and every part of our humanly efforts are bountifully rewarded no matter how meagre the beginning was. We flourish in all kinds of places and with all kinds of professions whether big or small, academically, technologically, agriculturally, economically or professionally. This is why like the Israelites were enslaved in Egypt to help move their economy forward, we are also caged in a falsefied Nigeria to also enrich her in all ramifications. In sports, we Excel, in academics, theatre, music, technology, trade and commerce and talking of oil and gas, we house the main source of her income. Her dependent on BIAFRA is so enormous, the present administration has murdered us in thousands for demanding our release and freedom from such a suffocating union. The Indegineous people of Biafra has been oppressed and suppressed beyond description just for the purpose of curbing them into submission and milking from their rich oil well daily. Strangers from faraway north and west have taken hold of her estate and boundaries in the name of one nation. In reality, one nation depicts deception, corruption, intellectual, social, structural and systematic robbery that will forever leave Biafrans incapacitated and enslaved habitually to these marauding oppressors who has foreign allies as concerned and prospective customers and supporters. For the love of Biafran oil, technology and skill, their focus remain unshifted as they readily commit crimes against humanity in her with impunity and audacity. 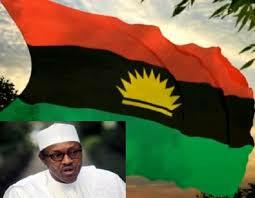 The world has been made to believe in lies before when our Biafran leader and Warlord arose to the occasion in 1967_70. He fought the deceived foreign allies gathered against her and fully motivated to extinct us. Pharaoh had done the same with the Israelites. They increased their pains with workload for demanding to go but at the appointed time, God sought Moses out to go tell him "Let my people go" Likewise, he has gone to faraway Britian to select Nnamdi Kanu, to tell the Nigerian government Let my people go! The most interesting part is that Moses had been raised by the enemies in their palace; so Nnamdi has been residing with our foe in Britian for many years. Who can doubt the strategies of God now? He had sworn; never to release our leader Kanu, to kill more Biafrans than he did in 1967-70, and that it was over his dead body that Biafra will come and just like Pharaoh perished in the red Sea, he has gone missing and remains unfound in UK. Recently, Justice Binta of the Federal High Court has declared IPOB lawful and we have now crossed our Rubicon, no amount of witchery or wizardry will hold down our Biafra anymore. As little by little our mighty ocean is been made so will all our hurdles be crossed. Gradually, as we approach the 7th March, we March with resolve, unrelentingly. We will not look back like Lot's wife but move forward like Israelites. For when the Rubicon is crossed, the die is cast.